It’s easy to become bewildered by the range of Electronic Point of Sale (EPOS) systems currently on the market and important to choose the right system for your business. Whether you run one branch or 50, getting the most suitable EPOS can mean the difference between gaining control of sales, stock and ordering, or completely losing focus of customer service and product selection. 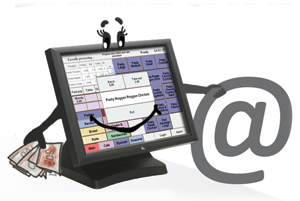 AlfaRichi provides a full range of web-based EPOS, and also solves the problem of accessing EPOS if connection to the internet is lost. AlfaRichi caters for all businesses, accounting for size and bespoke needs, as well as being able to install systems anywhere in the UK and Ireland. Equipped with the experience and knowledge in this field, AlfaRichi will be able to assist in choosing the best solution for your needs, to technical support once up and running. Standard EPOS solutions do not make use of real time internet connections and it is necessary to both purchase the original software and later pay for software updates and upgrades when new functionality and features becomes available which can be inconvenient, not to mention costly. Add to this any fees incurred for an engineer to come out and fix problems when they occur plus monthly fees covering support and it becomes apparent that this is not a cost-effective idea. AlfaRichi provides a web-based solution that offers the peace of mind that all your data is secure, and you can see reports 24 hours a day with an internet connection. Any new features and functionality that are available are simply sent to tills via the web, as soon as the upgrades become available. There’s no forking out for new software versions when they come out because these are included in the all inclusive monthly fees. A Web based system is scalable and additional terminals, shops and users can be added depending on the changing landscape of your business. Almost all technical problems can be sorted out remotely. Like any EPOS solution, the hardware has to be purchased, rented or leased but the software can either be purchased or rented. AlfaRichi can install all of this for you, so you can focus on what matters most; managing your workforce, serving customers and maintaining the efficient running of your business. By purchasing AlfaRichi’s innovative web-based solution, you no longer need to run the risk of losing access or data, should your web connection go offline. AlfaRichi software is web based and has all the advantages described here as well as included a very rich set of features for sales, stock control, ordering and reconciliation. Contact us, where you will find details of services and products that AlfaRichi provides.